North Staffs TV aims to feature as many films as possible made by local people. This week we have been speaking to local film maker Richard Steele about his film The Adequately-Clothed Philanthropist and also find out what got him into film making. The film is about a Trade Union leader who goes undercover in order to find out how the state of modern business operates within traditionally public, state-funded services. Richard got the idea for the film watching a few episodes of The Secret Millionaire and Undercover Boss. He always thought that a few grand from a millionaire for a charity doesn’t solve anything in the long run, despite their good intentions. So he thought what if the system could change? After all, the same system allows for such parity between rich and poor in the first place. So it was a reversal – An average guy going ‘undercover’ with the representatives of neoliberal capitalism. 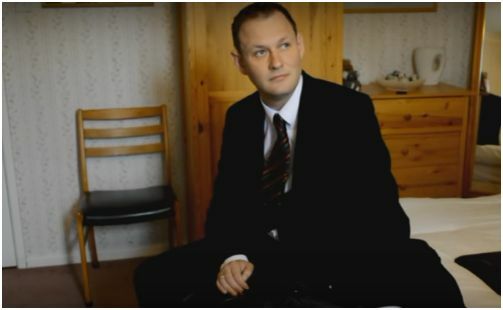 As for the ideas for what the main character is up against, these were all based on articles he read in the press beforehand – companies like Argos and Poundland did agree to take on benefit claimants as working for their benefits, and PFI hospitals are always looking to drive down pay and conditions. The title of the film is a humorous spin on the title of Robert Tressell’s excellent novel ‘The Ragged-Trousered Philanthropists’, about the reality of being working-class in the early part of the 20th Century. The draconian conditions and unsteady work seems to be resurging today with zero-hour contracts etc. In regards to the filming altogether it took about 2 weeks, although not every day. It was shot out of sequence to accommodate the actors’ availability. In total it was about 3 months or so, from mulling over the idea to finished edit. Richard toyed with the idea of making it into a series, as there are so many other aspects of modern society that could have been highlighted through satire – particularly the issue of forced academization of schools, but in the end he decided to focus on the NHS and workfare. It was just a case of breaking it up in the script and trying to emulate the type of reality shows he was imitating. For the film production there was Richard and his actors Rob Bateman, Kerry Sirrell, Rosemarie Gibson. He also talked local film maker John Williams into taking a part too. As it was his first film in 4 years at the time John also gave him some guidance in pre-production. Cost wise, there wasn’t that much to buy, just a litter grabber and a set of scrubs for the nurse but that was about it! For locations he asked Burslem School of Art and Newcastle Baptist church for permission to film there to give the impression of many different locations. You can watch the film below. Do let us know your thoughts on this locally made film. This entry was posted in Local Film and tagged Film, Local Film, Richard Steele, The Adequately-Clothed Philanthropist on 2016-07-26T19:18:14+01:000000001431201607 by NSTV News Team. As information it is already out there and as a film its a bit boring and lecturing. It’s a documentary style and the idea of copying the format of secret millionaire is ok but not brilliant. I wouldn’t put it as an innovative film.